The 3rd Annual FIDO Awards is just around the corner! Don't miss this "bark" tie event benefiting the Palm Springs Animal Shelter! 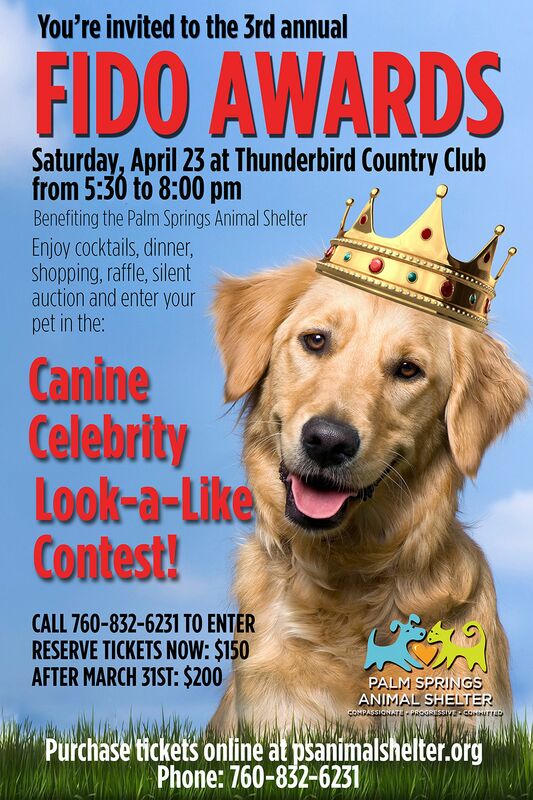 The event takes place at the Thunderbird Country Club and this year guests will enjoy signature "Mutt Martini's", seated dinner, shopping, silent auction, and a Pet Celebrity Look-A-Like Contest. Tickets are $150 until March 31st! Admits 10 and counts as $8,800 votes to dog of your choice. Includes preferred seating, your name in the slide deck, a swag bag from PSAS and an acknowledgement during the event. Admits 10 and counts as $5,000 votes to dog of your choice. Includes preferred seating, your name in the slide deck, acknowledgement during event. Admits 2 and counts as $1,000 votes towards dog of your choice. Includes preferred seating. TICKET PRICE: $150 until March 31st. $200 after early bird deadline. Call 760-832-6231 for more information on tickets, sponsorships and entering your pet in the Celebrity Look-a-Like Contest!